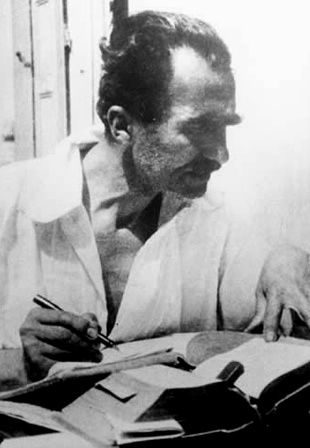 Internationally-acclaimed author Nikos Kazantzakis (1883 - 1957) lived on the island of Aegina for varying periods of time, beginning construction of a house there in 1936, and living in it during the years of the German occupation of WWII with his wife, Eleni. The house is located in the vicinity of the lighthouse on Aegina's northwest tip, in the area known as Plakakia. It is a private house, NOT open to visitors. Kazantzakis loved Aegina from his earliest years, because it was flooded with light all year round. It was in Aegina that he wrote some of his most important works, as well as carrying out writing projects to provide him with the meager funds needed for his ascetic existence work involving translation, dictionary, primer. He moved to Aegina in 1927, to the house of Pavlos Hanos, and devoted himself to working on his Modern Sequel to the Odyssey, which he had begun in 1924, in an Athens suburb. He was attracted not only to the light of the island, but to its peaceful silence, and, feeling a need to root himself somewhere, bought a field in 1935, near a house in which he had lived since 1933. The following year the foundation of the house was laid, which was completed a full decade later, in 1947. 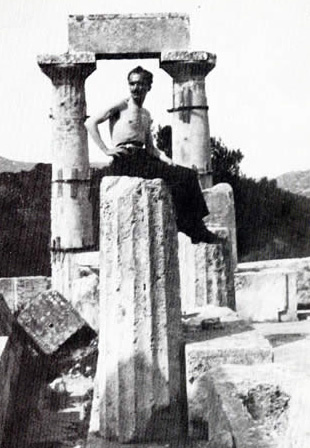 It was likely that Kazantzakis worked on his seventh draft of his Odyssey in his new home. 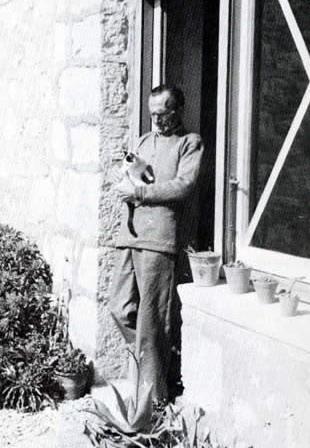 He wrote to his wife in 1939, praising the house as "good, simple, full of light, the sea like glass, the mountains serene and good-hearted, the earth lush and green….. I owe all this to solitude. I would have done nothing, and been nothing, without solitude." Writers who wanted to meet him visited often, savoring his words. 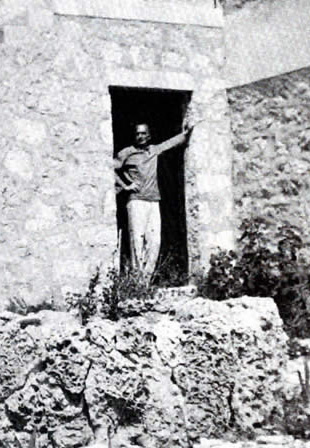 An essay writer described Kazantzakis' garden (where visitors were received) as African , "a piece of dry earth, all gravel and no trees and only a few cactuses, with a stone wall enclosing it." The visiting writer found this garden similar to its owner, "dry, frugal, without vegetation, thorny - the house inside simple, with little furniture." 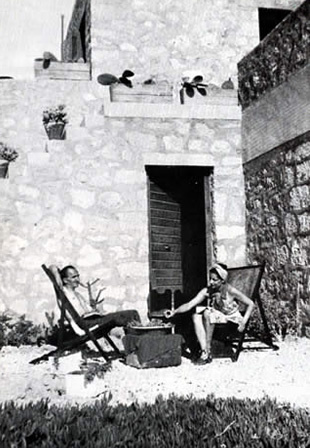 Kazantzakis' wife, Eleni, wrote in 1936 of the trials and tribulations involved in building that house. They had determined to have a country house that would be indistinguishable from the houses on any Greek island - a house with simple terraces, a cistern underneath, an external staircase with steps made of a solid slab of stone, windows looking out only upon the sea, all living necessities on the ground floor, with the writer's "eagles nest" up above. Eleni desired a house in the shape of the Greek letter Pi (Π) but the architect found the cost exhorbitant and cut off one of the legs. Her husband exclaimed over the beauty of the new shape - the letter Ghamma (Γ), which was also the number 3 (being third in the Greek alphabet) and which was his favorite number. Next, the couple disagreed over successive house plans, Eleni wanting a house penetrated by the surrounding nature, while Nikos desired a fortress - all cornerstones without plaster, indistinguishable from the surrounding rocks. The architect had four doors in mind, while Nikos wanted to abolish three of them. Things ended up with a compromise of two. Hence the veranda facing the sea had no entry to the rest of the house, though Eleni won a door for the kitchen. Further quarrels ensued over the external staircase, with Nikos insisting that this would be the only way of ascending and descending between levels, as it disgusted him to have some many 'holes' in the house. Things got somewhat easier after that, but on the subject of the windows that almost went mad. Looking at the house plans, they enthused over the large windows, but when Eleni went off to Athens, the builders complained to Nikos that his architect was a fool, and that with such large openings they would never be able to lay tiles and cement. Their friend, Kalmouchos, who literally terrorized Nikos, took the side of the builders, and upon her return Eleni found a series of identical rectangles, one after the other. Building and tearing down what was built went on for some time. The builders were colossi from Asia Minor, Thodoros and Ignatios. Eleni describes them diving into the sea and returning with a huge rock, which they proceeded to cut into pieces from which to build the house walls. Thodoros, in an effort to economize on sand, insisted on using that which was freely available all around them and easily cleansed of its salt with fresh water. They agreed, but with unfortunate consequences. Snowy fuzz appeared on the interior walls of the house and all but ate the books piled on their shelves. 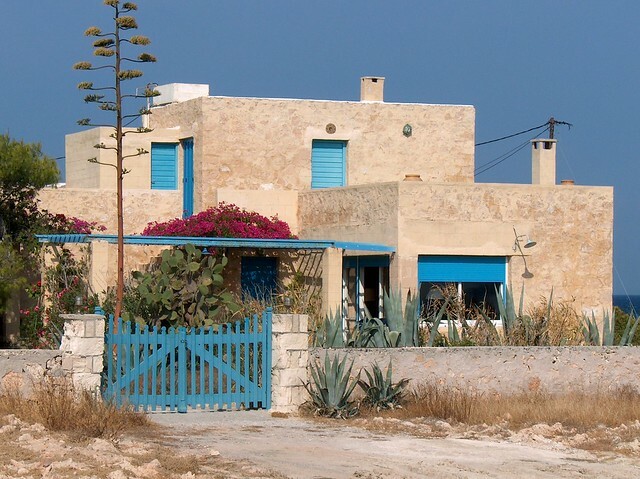 After the completion of the house, which Eleni and Nikos lived in during the German occupation, Nikos remembered his time within that house with nostalgia. In 1952, he wrote from Antibes to the writer, Tasos Athanasiadis, "I don't know when I'll return to Greece", but I'm going to sell the house in Aegina and uproot myself. On my desk there, I have a large clod of soil from Crete." * Details taken from an essay by Θανάσης Παπαθανασόπουλος, Το σπίτι του Καζαντζάκη στην Αίγινα, in the periodical Αιγιναία, Ιανουάριος-Ιούλιος 2010. Written on Aegina in 1941, under the original title The [Saint's] Life of Zorbas. The final version was completed in 1943. Part of the prologue was published in issues 11-12 of the literary magazine Kritikes Selides [Cretan Pages], (December 1936 - January 1937) pp. 290-292; Kazantzakis was most probably already planning the novel at that time. On returning from Western Europe in April 1933, Kazantzakis went to Aegina, the place where he had already chosen to settle permanently. He continued to work on theOdyssey, while also composing the cantos for his Tertsines, translating Dante, Cocteau, Hauptmann, Shakespeare, Pirandello and Goethe, and writing travels books, plays and novels in French. In 1936 he began building his own house on the island; he moved in with Eleni a year later, before building work was complete. 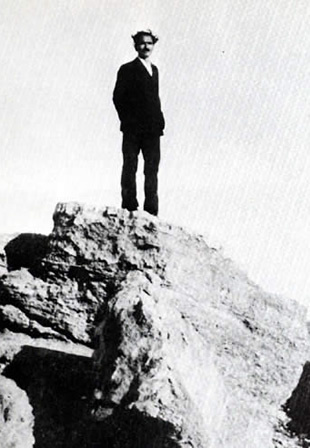 Kazantzakis only rarely left Aegina, on some occasions to travel (to Japan and China, Spain and England) and in 1938 to supervise publication of the Odyssey.